Thank you to the marvelous donors who helped us purchase a Motor King! On Tuesday, our Motor King arrived, all assembled and ready with drums for hauling water. 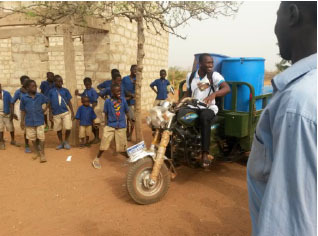 There was so much excitement and many teachers tried their hand in the school compound, and found out very quickly that driving a Motor King is quite different from a motorcycle. Wuni Baani, the Lunch Program Coordinator will be in charge. With Charles’ help and local entrepreneur with expertise in these vehicles, I drew up a simple contract /guide for the Motor King driver/caretaker. He’s practicing this weekend and will have scheduled time with students to bring water to school.